All Mutual Fund Schemes offer two plans- Direct and Regular. In a Direct Plan, an investor has to invest directly with the AMC, with no distributor to facilitate the transaction. In a Regular Plan, the investor invests through an intermediary such as distributor, broker or banker who is paid a distribution fee by the AMC, which is charged to the plan. 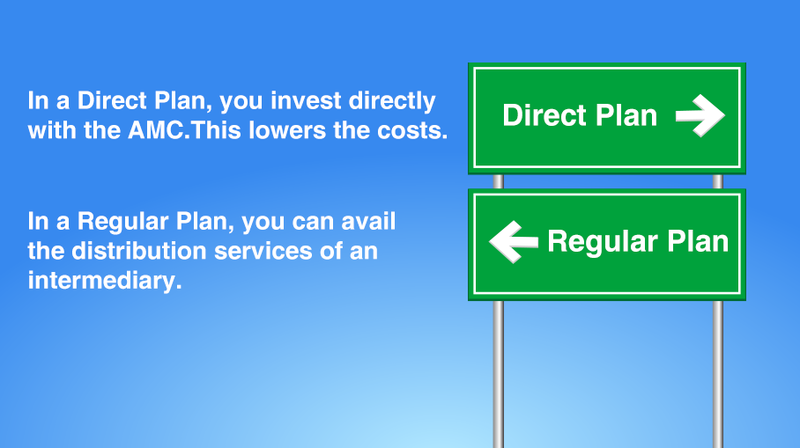 Therefore, the direct plan has a lower expense ratio as there is no distribution fee involved, while the regular plan has a slightly higher expense ratio to account for the commission paid to a distributor to facilitate the transaction. Managing a MF scheme entails costs and expenses, like fund management expenses, sales and distribution expenses, custodian and registrar fees etc. All such expenses are covered by the expense ratio of the fund. Such expenses are within the limits prescribed by the regulator – SEBI. Thus if an investor chooses to invest directly through the Direct Plan, she may get marginally higher return on account of savings in expenses, but she would not be able to avail of distribution and related services of an intermediary.